Hi There! Today I will present you a paper by Matthew Holman and Matthew Payne, entitled Observational constraints on Planet Nine: Astrometry of Pluto and other Trans-Neptunian Objects, which aims to derive constraints on the hypothetical Planet Nine from the orbits of small bodies, which orbit beyond the orbit of Neptune. For that, the authors investigate how an unknown, distant and massive planet, could improve the ephemerides of the known Trans-Neptunian Objects (TNOs). This study has recently been accepted for publication in The Astronomical Journal. Here is a longstanding pending question: is there a ninth planet on the Solar System? Some will answer: Yes, and its name is Pluto. But as you may know, Pluto has been reclassified in 2006 as a dwarf planet by the International Astronomical Union. So, is there another ninth planet, still to be discovered? In January 2016, Konstantin Batygin and Michael Brown, answered “probably yes” to this question, from the orbits of TNOs. They discovered that the clustering of their orbits could hardly be due to chance, and so there should be a cause, which has a gravity action. Since this study, several groups try to constrain its orbit and mass, while observers try to detect it. 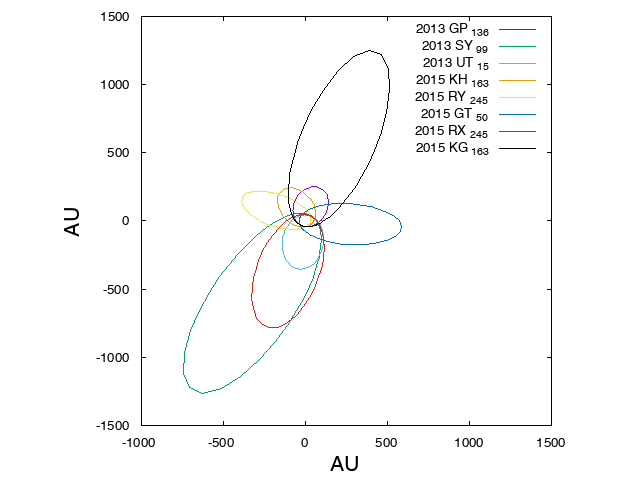 In 2014, Chad Trujillo and Scott Sheppard discovered a TNO, 2012VP113, whose apparent orbit seemed to be too difficult to explain with the known planets only. This made a case for the existence of the Planet Nine. 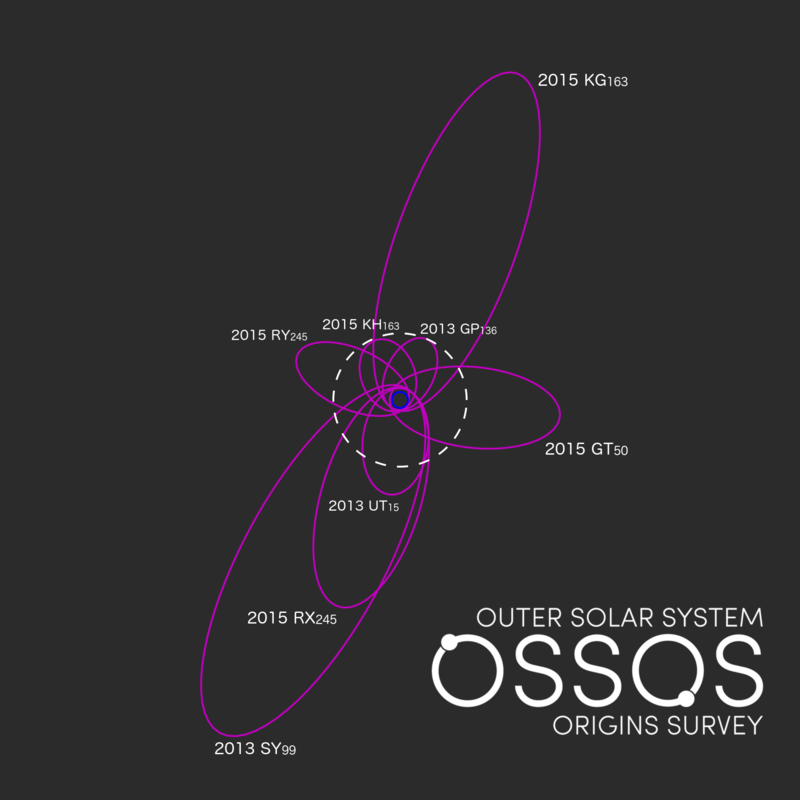 In 2015, a team led by the Brazilian astronomer Rodney Gomes, showed that a Planet Nine could explain an excess of bright object in the population of the most distant TNOs. In January 2016, Batygin and Brown published their result, which triggered a bunch of other studies. Renu Malhotra, Kat Volk and Xianyu Wang, from the University of Arizona, considered that the largest TNOs could be in mean-motion resonance with the Planet Nine, i.e. that their orbital periods could be commensurate with the one of the Planet Nine. Such a configuration has a dynamical implication on the stability of these bodies. In such a case, the TNO Sedna would be in a 3:2 resonance with the Planet Nine. A team led by Agnès Fienga, from the Observatoire de la Côte d’Azur (France), has suggested that a signature of the Planet Nine could be found in the deviation of the Cassini spacecraft, which currently orbits Saturn. The JPL (Jet Propulsion Laboratory, NASA) does not seem to believe in this option, and indicates that the spacecraft does not present any anomaly in its motion. Gongjie Li and Fred Adams, based respectively at the Harvard-Smithsonian Center for Astrophysics, and at the University of Michigan, show that the orbit of the Planet Nine is pretty unlikely to be stable, because of passing stars close to the outer Solar System, which should have ejected it. Matthew Holman and Matthew Payne, from the Harvard-Smithsonian Center for Astrophysics, tried to constrain the orbit of the Planet Nine from the orbits of the TNOs. 268,000 AU: Proxima Centauri, which is the closest known star beside the Sun. The astrometry consists to measure the position of an object in the sky. Seen by a terrestrial observer, the sky is a spherical surface. You can determine two angles which will give the direction of the object, but no distance. These two angles are the right ascension and the declination. Determining the right ascension and the declination of an object you observe is not that easy. It involves for example to have good reference points on the sky, whose positions are accurately known, with respect to which you will position your object. These reference points are usually stars, and their positions are gathered in catalogs. You should also consider the fact that an object is more than a dot, it appears on your image as a kind of a circle. To be accurate, you should determine the location of the center of the object from its light circle, due to light diffraction. You should in particular consider the fact that the center of the light is not necessarily the center of this object. the longitude, which locates the body on its orbit. The first 5 of these elements are constant if you have only the Sun and an asteroid; in practice they have a time dependence due to the gravitational perturbations of the other bodies, in particular the giant planets, i.e. Jupiter, Saturn, Uranus and Neptune. This study aims at identifying the gravitational influence of the Planet Nine. A numerical simulation gives you the orbit of an asteroid perturbed by the Sun and the giant planets. But for that, you need to know initial conditions, i.e. the location of the body at a given date. The initial conditions are derived from astrometric positions. Since the astrometry does not give exact positions but positions with some uncertainty, you may have many solutions to the problem. The best fit is the solution which minimizes what we call the residuals, or the O-C, for Observed Minus Calculated. All the O-C are gathered under a statistical quantity known as χ2. The best fit minimizes the χ2. 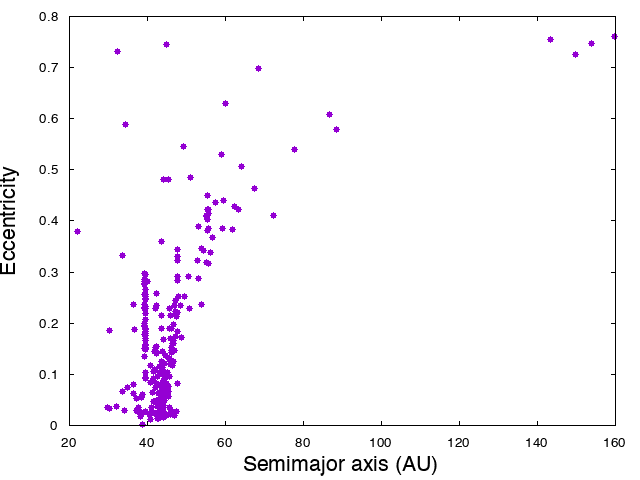 The purpose of this study is to use 42,323 astrometric positions of TNOs with a semimajor axis larger than 30 AU, 6,677 of them involving Pluto. For that, the fitting algorithm not only includes the gravitational influence of the giant planets, but also of 10 large TNOs, and of the hypothetical Planet Nine, in considering two models: either the Planet Nine is moving on a circular orbit, or it is a fixed point-mass. Its expected orbital period, i.e. several thousands of years, is so large that no significant difference between the two models is expected, given the time span covered by the observations. Indeed, the two models give pretty the same result. The authors split the sky into several tiles, to check the preferred locations for the Planet Nine, and it appears that for some locations the fit is better, while it is worse for some others. They also find that if the Planet Nine has a mass of 10 Earth masses, then the distance of the Planet Nine to the Sun should be between 300 and 1,000 AU, while Batygin and Brown found it to be between 400 and 1,500 AU. This discrepancy could be explained by the presence of an another planet at a distance of 60 to 100 AU. In addition to that, the node of the Planet Nine seems to be aligned with the one of Pluto, which had already been noticed by other authors. This could reveal an enhanced dynamical interaction between them. Finally the authors acknowledge that the astrometric positions have some inaccuracy, and that further observations could affect the results. The quest for Planet Nine is very exciting, and I am pretty sure that new results will come in a next future! The study, made freely available by the authors here, thanks to them for sharing! The study by Gomes et al.